Towel warmers, heated towel rails, not only offer visual appeal but serve as a mutli functional accessory. Once marketed only to upscale spas and hotels, homeowners on any budget can now afford the luxury of owning a towel warmer. Towel warmers are designed to warm and dry bath linens faster than air drying. It is sustainable and a more energy efficient way to reduce laundry loads with the added benefit of keeping "damp" towels from becoming mildewed and unsanitary. Moreover, in colder temperatures, most towel warmers also serve as space heaters. Stainless steel towel warmers have proven to be more sustainable and resistant to corrosion and flaking than those that are chrome plated or powder coated. Towel warmers now come in a wide range of shapes, sizes and finishes. Most models are designed to run continuosly, however, towel warmers are extremely energy efficient. Towel warmers use less electricity than several light bulbs and may add a thermostat and/or timer and accessories. All collections from Amba Tower Warmers including Jeeves, Quadro, Elory, Antus, Sirio, and Vega offer these various options. Not only do towel warmers warm and dry damp towels, they generate radiating, gentle warmth that can double as an alternative source of heat in the bathroom. Towel warmers also prevent mold from creating and are child friendly as well. Towel warmers reduce laundry loads! Electric Towel Warmers are great for drying damp clothes like socks and mittens. They are also ideal for drying delicate garments like lingerie and sweaters. As an added bonus, hang dry pants to dewrinkle. Anyone who owns a pool or spa can benefit from a towel warmer. They are wonderful for keeping towels and bathing suits dry. Towel warmers also combat the damp humity that is enclosed in pool areas. Amba even offers large 81 and 62 inch unites for spaces like these. GaragesMost Amba Towel Warmers can double as space heaters, great for keeping wet garages mildew free. Also great for warehouse/garage style living. Great for Alaskan climate! Mud RoomsMud rooms can quite possibly be the most important room in a home, serving as a rear or side entrance used by residents. Amba Towel warmers are great for kid's damp clothes and helps keep moisture out of the air making floors slip-resistant. Great for drying and warming ski equipment and jackets. HotelsAn incredible luxury and major asset to any hotel bathroom, Amba Towel Warmers complete the relaxing, memorable experience found in any resort. Also reduces laundry cycles, great for drying bathing suits and ski equipment. An appropriate size towel warmer installed in a basement can remove dampness and provide radiant heat, keeping your basement dry and warm. Amba Towel Warmers' custom range is ideal for these spaces. Need Advice on What to Look for When Selecting a Toilet? If you think a toilet is just a toilet then look around. You will be amazed at all the options you have. Both in function and in style. Kohler has an awesome tankless Fountainhead™ toilet. This minimalist design is a great example of just how much toilet design has evolved. The Kohler Fountainhead™ also has great features like a night light and a heated seat. Of course toilets are the work horse of the bathroom so along with fashion and you will be confident about performance. There have been a lot of advances in flushing technology so there are a few different types of systems out there. Bottom line, what you are looking for is a thorough dependable flush. Kohler has in depth information about all of its toilets. As we talk about innovations, water conversation is something really catching on with toilets. The Kohler Persuade™ dual flush toilet is a great way to save water. It has an eco-friendly flush option, for liquid only, which can save a household of 4 between 2,000 and 5,000 gallons of water per year over a standard toilet. There are lots of styles of water conserving toilets available such as the Kohler Escale™, Purist®, Hatbox®, and Saile™. See our website for all the options. Once you have thought about performance you now want to think about comfort. That has a lot to do with the shape and size of the bowl. There are 3 bowl shapes: Round, Elongated, and Compact Elongated which is ideal for small spaces. Another convenient feature is what Kohler calls Comfort Height. Toilets with this feature are designed to be a little higher. About the seat height of a standard chair which makes sitting and standing for most people much easier. Generally one piece toilets tend to look a little more streamlined and sleek while two piece toilets suit a more traditional style bathroom. When it comes to style you can find a toilet to fit any design you prefer from classic to contemporary. There are lots of color options now besides white and biscuit. You kind find all Kohler Toilets and Kohler Faucets at eFaucets.com, the largest online retailer of faucets and fixtures for the kitchen and bath. I just recently stayed at the W Hotel in New York Times Square as a member of American Express and their fine hotel program. They give me all the awesome upgrades and complimentory suites including hotel dining. The W Hotel in New York was no exception. The W Hotel is very swanky and the bathroom amenties hit the mark and got my attention as a faucet connoisseur. 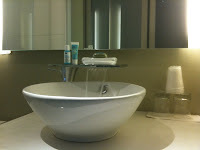 Not many hotels that I have stayed at have had an AXOR faucet from Hansgrohe waiting for my critique. I was in faucet heaven. AXOR is a division of Hansgrohe and the faucets in this line are created by the best designers in the world. The faucet in my Hotel room was the Hansgrohe Axor Massaud. I took the photo to the right and these are the actual photos of the products in the hotel. The symbiosis between man, nature and space is the central idea from French designer Jean-Marie Massaud, who made a name for himself in product design as well as with architectural projects. Together with Axor he has redefined the philosophy of the bathroom. The result Axor Massaud. Here the gently curved line of a blade of grass. The natural fall of the water. In between clear, geometrical forms and ingeniously hidden technology. Born in 1966 in Toulouse/France, Jean-Marie Massaud attended the renowned school "Les Ateliers", Ecole Nationale Supérieure de Création Industrielle in Paris. Whether it is a sofa, an exhibition stand or a football stadium, in all his work Jean-Marie Massaud is pursuing the trace to our origins. The same applies in the bathroom. "I have a vision of complete harmony between man, nature and technology. In order to fulfill this harmony the bathroom must become a living space, a space where we feel good." The new Elate™ Kitchen faucet is is a great introduction from Kohler for 2010. This faucet features Kohler's cutting edge style but is still well within the price range of today's cutting edge consumer. The Kohler Elate™ pullout faucet features pause, aerate and spray functions along with ProMotion™ technology to help streamline a variety of prep and cleanup tasks both in and outside the sink. Plus, Elate's high-arch and minimalist design lines make it easy to clean and perfect for maneuvering large pots. eFaucets.com, the leading online retailer of faucets carries the full line of Kohler Faucets and will be the first to carry the new Elate™ faucet online. Ever wonder how tough it is to install your own bathroom faucet. 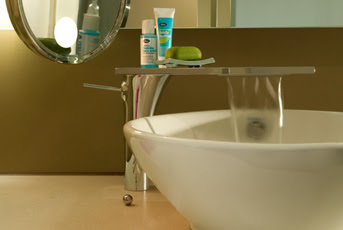 The great folks at Moen Faucets make it easy. Its as simple as buying online and installing it yourself with this video to save you $100’s of dollars. Just watch the video and follow the easy steps outlined below. 1) Before you start the install you will need to make sure you have a few basic tools. 2) Before you start actually installing the faucet, prepare the sink area. Always turn the water supply off before removing the existing faucet. 3) Now turn the faucet on to remove water pressure from inside the faucet and to ensure the water is completely off. 4) Disconnect the supply lines from the shut off valves. 5) Now we are ready to remove the old lift rod. 6) Take the old faucet off and make sure to clean and dry the mounting area before you start the installation of the new faucet. 7) Next you will need the faucet assembly, mounting nuts and lift rod and escutcheon gasket. 8) Place the new faucet on the sink with the new gasket provided. Use plumbers puddy if no gasket is provided to create a tight seal with the sink deck. 9) Tighten the mounting screws underneath the deck. If necessary you can use a basin wrench which makes working in a tight area easy and quicker. 10) Connect and tighten the supply lines to your existing hot and cold water supply lines. 11) You may need to install a new waste or drain assembly with your new faucet. For detailed instructions please refer to the instructions within your faucet box. 12) Next you will need to install the lift rod. Insert your lift rod through the hole in the top of the faucet. Insert the end into the lift rod strap which is connected the waste or drain assembly. Secure by tightening the lift rod strap screw to finalize the assembly. 13) Open the hot and cold water shut off valves before turning on the supply valves. 14) Now that the faucet is fully assembled, you are ready to test your new faucet. To avoid any damage to your plumbing, be sure to flush the new faucet. Make sure the handles are in the on position and allow the water to run for 15 seconds. 15) Your new faucet is now ready to use. The example faucet in the installation video is a brushed nickel life shine finish faucet from Moen Faucets. Moen’s Life Shine finish will not corrode and the finish will not wear off. 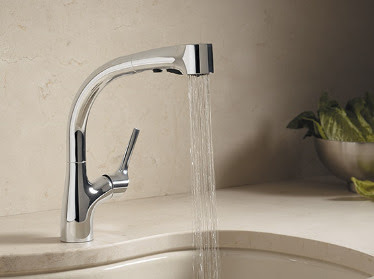 Moen Faucets are backed by a lifetime limited warranty. Moen is a featured partner and eFaucets.com is the online leader of faucets and your leading source for Moen Bathroom Faucets. Installing a new Kitchen Faucet is as easy as 1-2-3 once you watch this (DIY) Do-It-Yourself installation video from our partner Moen Faucets. Before you get started you just need to make sure you have just a few simple tools. A phillips head screwdriver, some adjustable wrenches, pipe tape, flashlight, safety glasses and plumbing puddy. The Faucet being installed in this video is a pull down faucet with a sprayer from Moen Faucets. You can check out Moen Kitchen Faucets at eFaucets.com, the online leader of Faucets, Fixtures and accessories for the Kitchen and Bath. eFaucets has all the Kitchen Faucets anyone can imagine for any home kitchen and style. The first thing you need to do is turn off the hot and cold water supply valves underneath the sink. Next you want to relieve any pressure from the existing faucet buy turning it on and removing and water still inside of it. Then you want to disconnect the water supply lines at the shut off valves. Unscrew the washer and nut for the faucet from underneath the sink and then remove the faucet from the mounting hole in the top of the counter top or sink. Now that the faucet has been removed. Wipe down the faucet mounting area to remove and water or debris. A pull down kitchen faucet should come with the pull down sprayer wand, weight, supply lines, and hardware. The first step in installing the new faucet is to take the mounting washer and put it over the supply lines all the way up to the base of the faucet. Now put the supply lines through the mounting hole and place the faucet on top of the deck. Take the washer on the bottom and attach it to the mounting stud and tighten so the faucet is secure to the countertop or sink. Now take the supply line for the spray wand and push it through the faucet spout. Connect the quick connect water lines from the faucet to the spray line. For Moen these are called Hyrdo-Lock connections. You will need to do this for both hot and cold water lines. Next turn the shut-off water valves back on and you are ready to flush the faucet out. Now you are ready to attach the wand assembly to the hose. Screw it on and then push the spray wand up to the faucet spout and the hose should go up into the spout. The final step is to attach the hose weight around the supply line for the wand underneath the sink. The weight is what help pull back or retract the wand when you let go of it. Mirroring the elegant lines of the famous French landmark, the Eiffel Series by Riobel is the perfect finishing touch in any bathroom or kitchen. Bringing these timeless pieces home is as easy as visiting eFaucets.com, the first online retailer to feature the new Eiffel Series. Blending modernism with rugged grace, the Eiffel Series is crafted to evoke the romance and sophistication of Paris. The collection comprises kitchen and bathroom faucets, a full selection for the shower, and an array of accessories like towel bars and rings. "Riobel has crafted a collection of faucets and fixtures unlike anything currently available," said Michael Fox, COO of eFaucets.com. "We're excited that Riobel has allowed eFaucets to be the first online retailer to introduce their brand in this country online." Finishes include chrome, brushed nickel, polished nickel and brushed night, which most resembles the tone and texture of the Eiffel Tower. All Riobel Eiffel Series pieces come with a lifetime warranty. These great, architecturally European inspired faucets will for sure be a conversation piece with your guests.